Not to be confused with the colour patterns on many bird eggs. 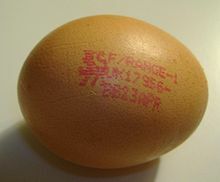 Egg marking is a form of egg labelling that includes an egg code stamped on the egg itself. In the EU there is a producer code regulated by law since 2004. It allows consumers to distinguish free range eggs and organic farming eggs from the industrial caged hen production. Note that egg labelling is used worldwide but mostly in the form of egg carton labels. In most countries there are legal definitions on the designation of the egg size, production method, packager identification and best-before dates. As there is more space on the carton there has been no tendency to create an egg code that is seen on the stamps used for egg marking. ^ "How to Decipher Egg Carton Labels: The Truth Behind "Cage-free," "Free-range" and Other Common Terms : The Humane Society of the United States". www.humanesociety.org. ^ "Eggs: trade regulations". Department for Environment, Food & Rural Affairs (United Kingdom). 2012-10-08. Retrieved 2013-04-05. ^ "REGULATION (EC) No 589/2008 laying down detailed rules for implementing Council Regulation (EC) No 1234/2007 as regards marketing standards for eggs". 2008-06-23. ^ "— DER SPIEGEL 2018/41". This page was last edited on 11 November 2018, at 18:35 (UTC).